Digital prints adhered to wood, aluminum discs. Queen Alexandra's Flight is the scene of a battlefield. 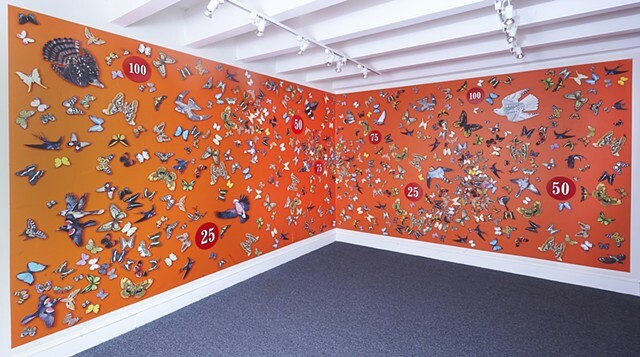 The depiction of butterflies vs. birds, narrates the age-old story of survival. Queen Alexandra's birdwing, of Papua New Guinea, is the largest butterfly in the world, and it is endangered. I have created an army of butterflies and moths to protect her in flight, from the insect eating birds. The number dots represent point delineators...victory points that are accumulated for a final score to "win the game."